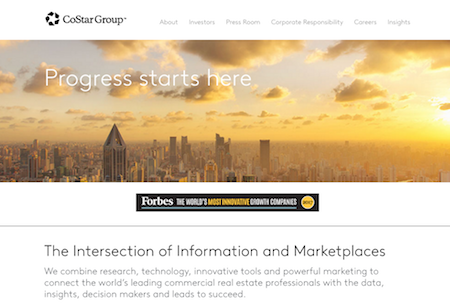 For the fourth consecutive year, Forbes added CoStar Group, Inc. to the Forbes World’s Most Innovative Growth Companies list. This honor highlights the company’s continued dedication to revolutionizing commercial real estate and multifamily industries by providing innovative software and solutions. In an average month, 25 million people visit CoStar Group’s family of websites to lease, buy or analyze office, industrial, retail or farm properties – or to find their next home on Apartments.com. The CoStar research team collects, investigates, and analyzes the in-depth market data necessary to help clients make the best decisions and drive connections between millions of properties and the thousands of companies that need those properties to grow their businesses. In 2016, 83% of all commercial real estate transactions involved a CoStar subscriber, and an estimated four million people found their rental homes on Apartments.com. Additionally this year, CoStar was named to the Forbes Fast Tech 25 list, which recognizes technology companies with the highest three-year sales averages. The 2017 list has CoStar placed at number 16, with 29% average sales growth for the past three years. Forbes produces the World’s Most Innovative Growth Companies list annually using a proprietary formula in collaboration with Credit Suisse, providing something completely unique in the world of innovation celebration by using the wisdom of the crowd. The innovation premium method relies on investors’ ability to identify firms they expect to be innovative now and in the future, analyzing the difference between their market capitalization and the net present value of cash flows from existing businesses. To qualify for consideration, companies must have seven years of public financial data and a market capitalization under $10 billion. The entire Market Connections team congratulates CoStar Group on this honor and much deserved recognition.